King Henry III (1207-72) was nine years old when he came to the throne in 1216. His reign was marked by serial misrule leading, eventually, to rebellion. In 1258 the baronage forced Henry to accept the Provisions of Oxford which placed the government in the hands of a feudal oligarchy. Henry, at the first opportunity, attempted to avoid the agreement. Henry had granted his younger brother Richard, Earl of Cornwall the manor of Isleworth, which then included Twickenham, in 1227. It was here that he built a house and the barons camped nearby in 1263 attempting, unsuccessfully, to make the king reaffirm his acceptance of the Provisions of Oxford. In the ongoing strife the house was sacked when the rebellion broke out the following year. On 12 May 1264 he was brought to battle, defeated and taken prisoner by a group of barons, at Lewes. Richard fought in this battle and had to take refuge in a nearby windmill where he too was captured. The barons were led by the king's brother-in-law, Simon de Montfort, Earl of Leicester. Although the king was not actually deposed, De Montfort effectively became king for the next 15 months until his defeat and death at the battle of Evesham. His Westminster Parliament to which two knights from every shire and two burgesses from each of certain towns were summoned, marked the starting point of the later House of Commons. 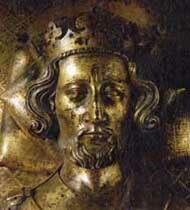 This work was carried forward by Edward I, Henry's son.